The city of Tucson may soon expand its support of urban farmers. On September 17, the Tucson Planning Commission voted in favor of changing the city’s zoning laws to be more friendly to small-scale urban farms. The proposal will now go to the city council for a final vote. Currently, many Tucsonians with vegetable gardens and backyard hens are in violation of city laws. So far, the city has been lenient with its interpretation and enforcement of the laws, but many urban farming projects are still technically illegal, and groups wishing to establish a community garden or farmers’ market are required to jump through bureaucratic hoops. If adopted, the new proposal will legalize and standardize practices that are already commonplace in parts of the city. Supporters of the change say that the current regulations are outdated and are based on farming as a large-scale, rural activity. They say its time for the law to catch up to Tucson’s small-scale urban farms. For example, the proposed changes would allow home-based food producers and community gardens to sell food at the site where it was grown. While farmers’ markets and community gardens currently have to file for a formal exemption from zoning codes in order to legally exist, the new proposal would eliminate this requirement and would permit urban farming projects in office and industrial zones instead of only in residential zones. The proposal also regulates raising small farm animals within city limits. In considering their recommendation, the planning commission reviewed letters from a number of supporters of the proposal . In addition to the long-term environmental sustainability benefits of urban agriculture, supporters highlighted the advantages of community collaboration, supporting small businesses, and boosting the local economy. They also noted that the proposed changes would reduce the burden on the city of costs and labor associated with excessive enforcement complaints. Proponents of the changes emphasized the benefits to low-income Tucsonians, offering evidence that urban agriculture combats food deserts, promotes healthy eating, and allows families to supplement their income with small-scale food production in their own backyards, according to an article in Edible Baja Arizona. The food bank runs a number of programs that could benefit from the proposed changes, including a community garden, a commercial kitchen that trains food entrepreneurs, and help for schools and local residents who want to start food gardens, according to a letter to the planning commission from Marco Liu, Director of Advocacy and Outreach for the Community Food Bank of Southern Arizona. The debate over urban farming regulations has been an issue in Tucson for several years, and the planning commission has already done five study sessions on zoning changes, according to Arizona Public Media. The question of raising chickens has been the most controversial, with a vocal minority of opponents appearing at several past city council meetings, according to KVOA Tucson. This is despite the fact that complaints about chickens currently account for less than 0.1 percent of zoning code enforcement requests, according to Merrill Eisenberg in an interview with Edible Baja Arizona. The new proposal would increase the number of birds permitted on residential lots. Animals are assigned a unit weight — chickens count as one unit each, ducks are two units, and turkeys or geese are four units. Residents will be permitted two units for every 1000 square feet of lot size. The allowance would be capped at 48 units for a lot that is 144,000 square feet or larger. That’s double the current cap of 24 units on the same size lot. Residents would be permitted to exceed these caps with written consent from adjoining property owners. Bird coops would also be allowed within 20 feet of neighboring properties, decreasing from the current rule of 50 feet which has drawn complaints from bird owners because some lots are only 50 feet wide, according to Tucson News Now. The new proposal also regulates raising other small food-producing animals including rabbits, rodents, and miniature goats. Opponents of the proposal were notably absent from this most recent planning commission meeting. 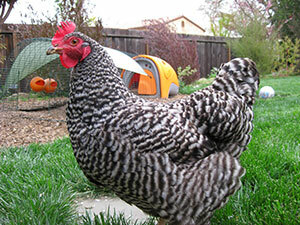 A number of backyard chicken owners appeared to voice their support. The crowd broke into applause when the planning commission announced their decision, according to Arizona Public Media.